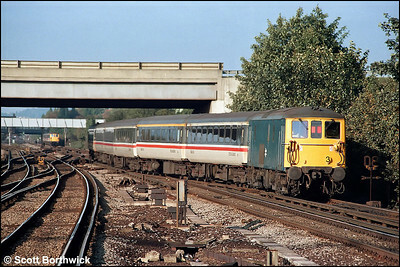 73117 unusually departs from the eastern platforms at Gatwick Airport propelling the 1535 Gatwick Airport-London Victoria on 04/10/1984. 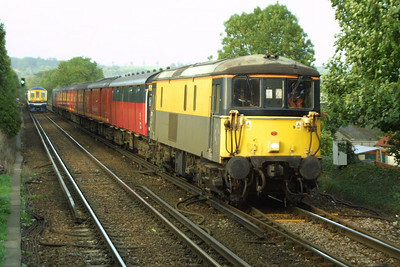 73113 awaits it passing in the distance in order to cross over into the more usual western platforms with the 1500 London Victoria-Gatwick Airport. 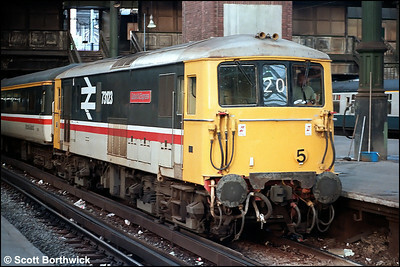 73123 'Gatwick Express' awaits departure from London Victoria with the 1500 London Victoria-Gatwick Airport on 14/10/1984. 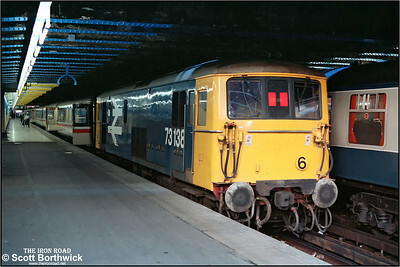 73138 awaits departure from London Victoria with the 1715 London Victoria-Gatwick Airport on 14/10/1984. 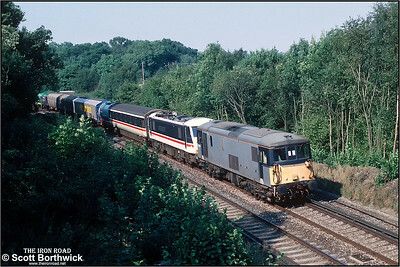 73136 passes Balcombe on 21/09/1991 hauling 90005 'Financial Times' and an assortment of wagons from Willesden Brent Sdgs to Brighton Lovers' Walk TMD for the following days open day in connection with the Brighton Line 150 celebrations. 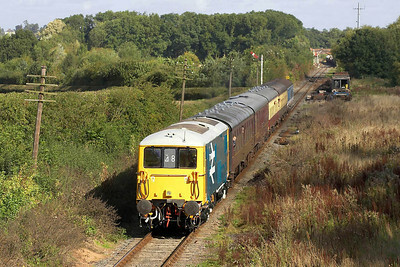 E6003 is pictured passing Woodthorpe on 18/09/2004 whilst in charge of 2C10 1105 Loughborough-Rothley during the GCR's Autumn Diesel Gala. 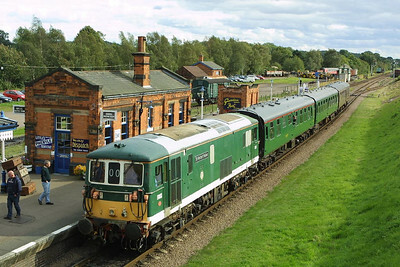 E6003 stands at Quorn & Woodhouse on 19/09/2004 with 2D31 1535 Rothley-Loughborough. 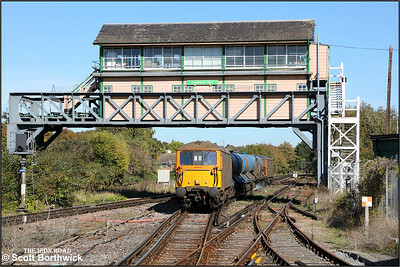 E6003 is pictured working 2C37 1605 Loughborough-Rothley at Kinchley Lane on 19/09/2004. 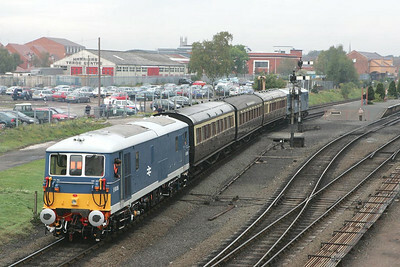 E6006 trails E6005 into Kidderminster station on 01/10/2004 with the ECS for the 1127 Kidderminster-Arley shuttle. 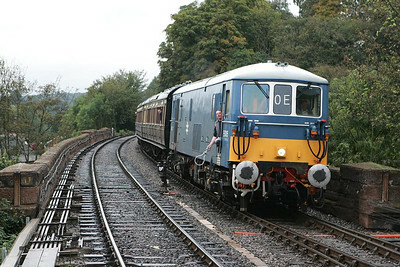 E6006 and E6005 emerge from Foley Park tunnel 'top & tailing' the 1127 Kidderminster-Arley shuttle on 01/10/2004 during the Severn Valley Railways 2004 Autumn Diesel Gala. 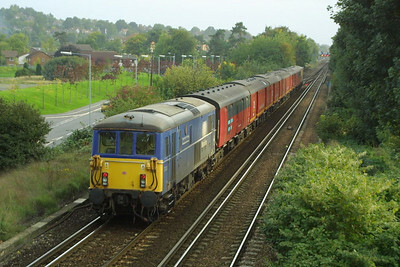 E6005 brings up the rear of 1127 Kidderminster-Arley shuttle, headed by E6006, after emerging from Foley Park tunnel on 01/10/2004. 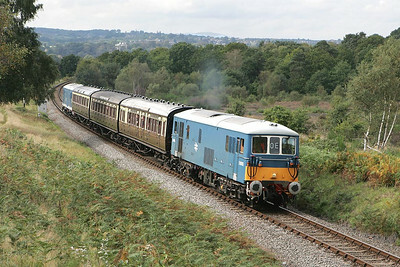 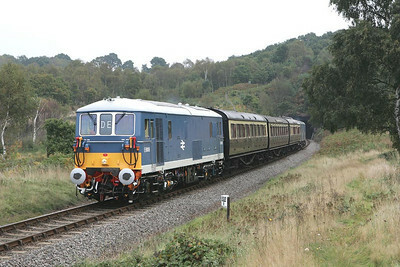 E6005 leads E6006 on the 1240 Arley-Kidderminster shuttle on 01/10/2004 prior to entering Foley Park Tunnel. 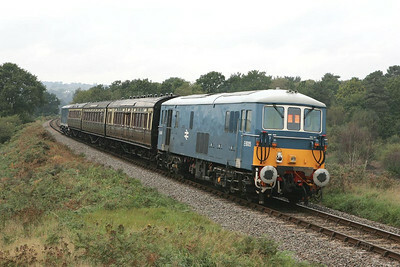 E6005 arrives at Bewdley in the rain with the 1729 Arley-Kidderminster shuttle on 01/10/2004. 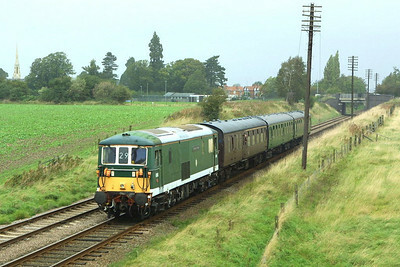 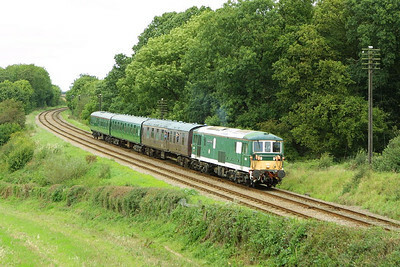 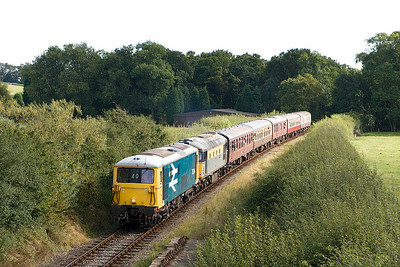 Still awaiting its numbers to be applied after its recent repaint, 73114 works the 1100 Shackerstone-Shenton service at Far Coton during the Battlefield Line's September Diesel Gala on 25/09/2005. 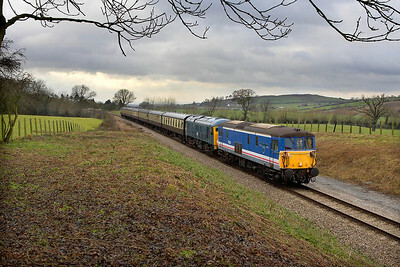 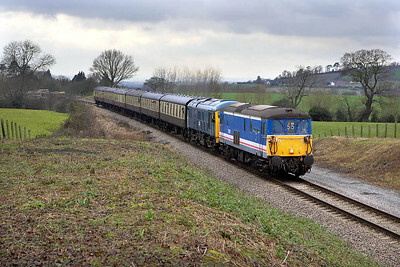 73129+24081 approach Dixton cutting with the 1315 Cheltenham Racecourse-Toddington service on 27/12/2005. 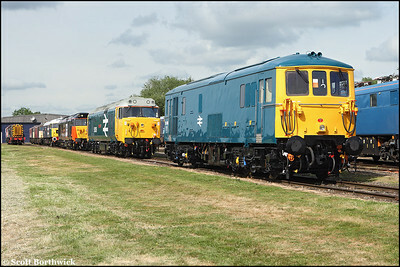 73006 resplendent in BR blue on display at Long Marston open day on 07/06/2009. 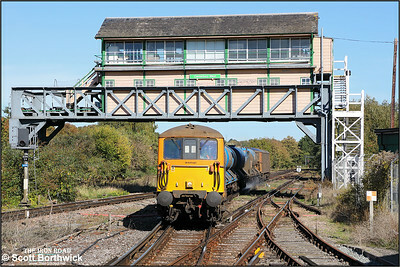 73141 top & tails 73107 whilst working 3W74 0546 Tonbridge West Yard GBRF-Tonbridge West Yard GBRF 'leafbuster' passing under the signal box at Canterbury West on 09/10/2018.